Grab your passport, 104-5 The Zone is off to London. 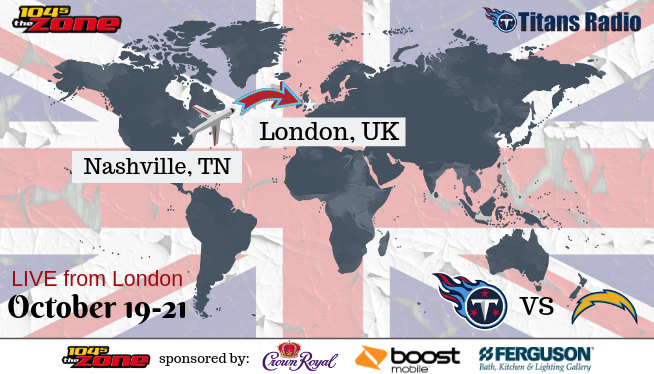 104-5 The Zone & Titans Radio will be bringing you full coverage from London starting Friday ahead of Sunday’s Titans (3-3) vs Chargers (4-2) matchup in Wembley Stadium. Kickoff is set for 2:30pm local time (8:30am CST) Sunday, Oct. 21. This week’s game marks the franchise’s first regular season game held at an overseas location. Listen as we broadcast LIVE on Friday, October 19th from London, UK with the Midday 180! More details to come! With special appearances from Titans Legends Eddie George, Jevon Kearse and Keith Bulluck. Plus appearances by T-Rac and the Tennessee Titans Cheerleaders. The official Titans fans meet up party to follow after broadcast.